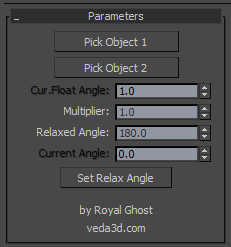 PushByAngle modifier – 3dsmax’s scripted modifier allows to “push” object vertices outward or inward along the average vertex normals on the value which is calculated from the angle of two chosen objects. PushByAngle extended version of 3dsmax’s Push modifier. Modifier support any kind of geometry objects. Place MAXScript file (.ms) to 3dsmax/plugins, then restart 3ds max. PushByAngle appears in Modifier List. v1.0.0 (08.10.2015) – Initial release for 3ds max 2012-2016+. VEDA3D.COM project devoted to modeling, rigging, animation and visualization of female characters with athletic body in 3ds max. The main objective of the project - the creation of videos with these characters and publication of materials to work on them.